A good power supply is an essential subject to the microcontroller’s base project; it’s like a heart that gives a life to our microcontroller. Sometimes we take it for granted the important of having an adequate power supply to our microcontroller project and this can lead to the unexpected result or behavior from the circuit. In this tutorial we will learn the principal of powering our microcontroller and how we could provide the microcontroller circuit with a good and yet simple power supply. “Mr. Scotty, I Need More Power” one of the famous phrase in the Star Trek movie; as the captain of the starship USS Enterprise want to increase the starship wrap speed. The same principal also applies to our microcontroller when we drive the microcontroller with higher clock speed in order to increase the execution time speed, we certainly need more power. Therefore we have to consider wisely and balancing between the speed and the power consumption. The following graph is the example of some popular microcontrollers with their operating voltage and frequency (for detail please refer to their respectively datasheet). From the above graph, we should always select the save operating area when we powering our microcontroller, for example using 4.5 Volt will be the safest operating voltage for all of the operating frequency range allowed by the microcontroller or when we use the clock speed up to 10 Mhz than a 3 volt power source will satisfied for all microcontroller’s types listed above. Next to the voltage is the amount of current needed to make the microcontroller to work properly. Nowadays most modern microcontroller only needs a tiny direct current (in micro ampere order) to operate as introduced by Microchip with their nanoWatt PIC microcontroller families or Atmel with their pico-technology AVR microcontroller families. 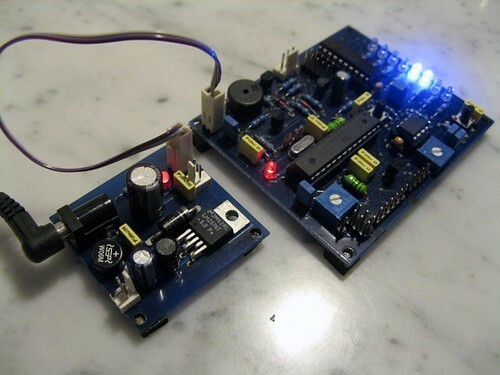 This type of microcontrollers makes them suitable for used as the portable devices in the remote area where the power is limited to the portable power source such as battery or the solar cell. One of the important things to be considered when designing your microcontroller’s base project is the maximum direct current (DC) allowed to pass through the microcontroller’s Vcc to Gnd pins; by looking at the microcontroller’s electrical specification on the datasheet this DC maximum current is typically around 90mA to 200mA; remember this is the maximum value; which mean when we reach this value the microcontroller will likely become permanently damage. 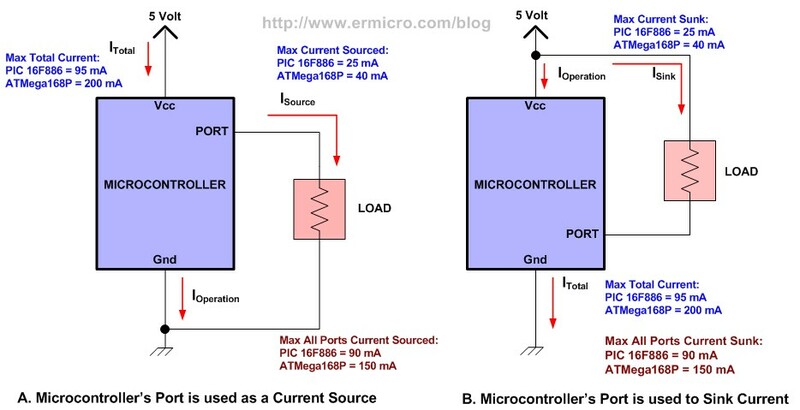 This maximum current is the sum of the microcontroller operating current and the entire load we put together on the microcontroller’s ports I/O. The following is the pictures of typical load connection to the microcontroller’s port I/O (the electrical specification is taken from Microchip PIC16F886 and Atmel AVR ATMega168P datasheet). As you see from the result; the value is already close to the maximum current allowed by the PIC 16F886 microcontroller’s electrical specification or almost a half of the maximum current allowed by ATMega168P microcontroller’s electrical specification; now let’s say you want to impress your friends by adding additional 8 LEDs to the other microcontroller’s ports I/O to make a nice chaser LEDs display; than the maximum current will be easily exceeded. Therefore is a good practice to run your microcontroller at the half of the maximum current allowed by its electrical specification and make sure you are sourcing or sinking the microcontroller’s ports within its electrical specification. 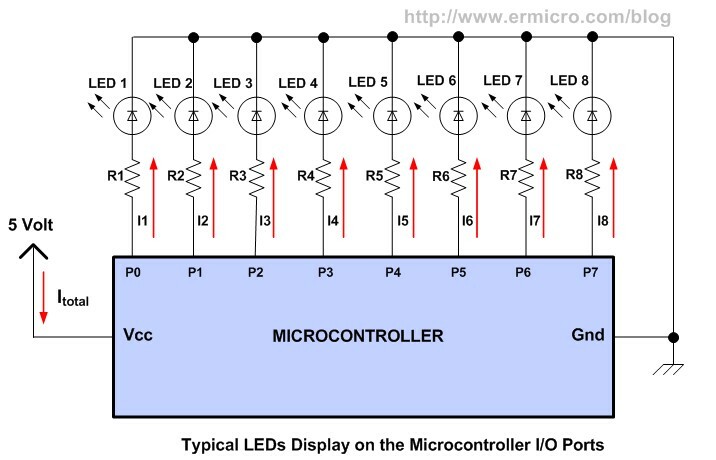 By knowing your microcontroller voltage, operating current and summing all the total current needed by the other supporting peripheral on the project such as LEDs, Motors, Relay, LCD, etc; now we could determine the right power supply to the project. All the microcontroller circuit needs a direct current (DC) in order to operate and the perfect source for this current type is a battery. 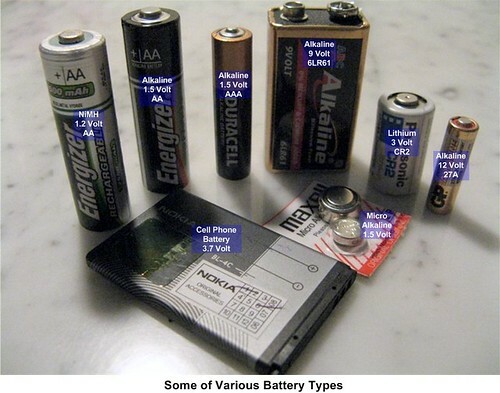 Today modern battery is evolve to be more compact yet more powerful to provide the power required by the sophisticated gadget such as cell phone, iPod, MP3 player, PDA, camera, etc. The best widely available battery for the microcontroller project is the AA type battery which available both in NiMH (Nickel Metal Hydride) rechargeable and Alkaline type; I always recommend this type of power source especially when you are doing your first microcontroller project. 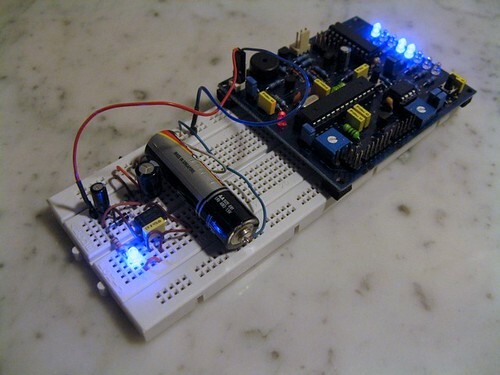 By using 3 AA alkaline batteries or 4 AA NiMH batteries in series, you will have 4.5 volt or 4.8 volt correspondingly which makes it the perfect power source for your microcontroller’s project; and if you operate your microcontroller below 10 Mhz, then you could easily use 2 AA Alkaline batteries in series that will give you 3 Volt power source for your microcontroller’s project. 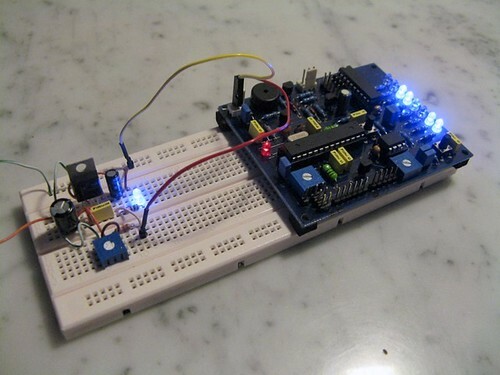 You could also experiment with various battery types such as the 3 Volt CR2 lithium used for powering the photo camera or 3.7 Volt cell phone batteries for powering your project. Before continuing, I would like to remain you about working directly with the electricity, that you should always take extra precaution and extremely aware to the danger of the electrical shock. 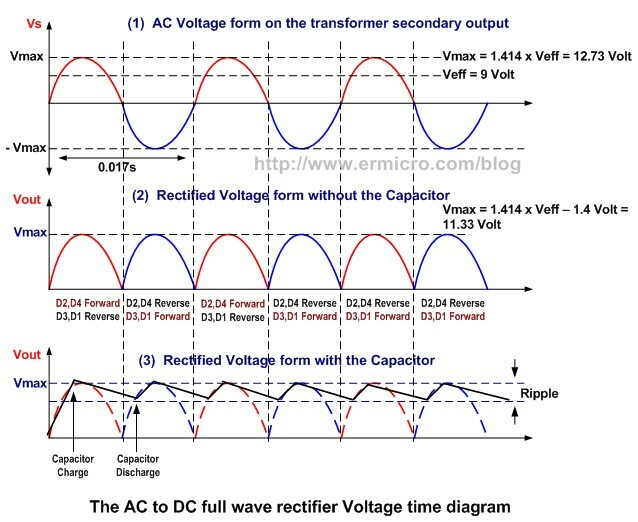 From the AC to DC converter circuit; the transformer is used to step down the voltage level from 220/110 Volt AC to 9 Volt AC, the diode D1, D2, D3 and D4 work as the AC to DC converter or known as a rectifier; the capacitor is used to filter the AC component (ripple) from the DC component. The LED and the 1 K current limiter resistor is use as the power indicator as well as the discharge circuit to the capacitor when we unplugged this circuit from the electricity power outlet. On the first-half cycle (red color), the D2 and D4 diode will be on (forward bias) while the D3 and D1 diodes will be off (reverse bias), this will charge the capacitor and when the AC wave is falling down then the capacitor will discharge its energy through the load; on the second-half cycle (blue color), the D3 and D1 diode will be on (forward bias) while the D2 and D4 diodes will be off (reverse bias), again this will charge the capacitor and when the AC wave is falling down, the capacitor will discharge its energy through the load. Today is not practical to build this circuit anymore as this kind of circuit is widely available on the market and usually called as the DC wall adaptor, so it is cheaper to buy it unless you have special requirement such as you need bigger current or multiple voltage output level at the same time; but for average microcontroller’s base project the 7.5 volt to 9 volt with 500 mA to 1 A rated DC wall adapter will be adequate. As you notice from the AC to DC converter circuit, the DC voltage produce by this circuit is depend on the load; the heavier the load (more current to the load) means the capacitor discharge time will be more faster and as a result the DC voltage output level will be drop. The circuit above is called unregulated AC to DC converter; because it could not maintain its voltage output level, this kind of power source could not be use in electronic circuit that required constant voltage level in order to operate properly such as in digital and microcontroller circuit. Therefore we need what is called Voltage Regulator Circuit and at the same time works as the DC to DC voltage step down. The first one is the analog voltage regulator, this type of regulator operate the transistor in its linear region (current gainer). The current supplied to the transistor base lead is depend on the voltage different between the reference voltage and output voltage apply to the error amplifier input; for example when the output voltage is greater than the reference voltage, than the error amplifier will make the transistor to conduct less, this mean the voltage drop across the collector and emitter (Vce) will be increase this will make the output voltage to decrease and vice verse. With output voltage being continuously compared to the reference voltage (close loop feedback) by the error amplifier, this kind of circuit could maintain its voltage output level constantly. The disadvantage of using this type of voltage regulator is the power dissipation (power lost as a heat) on the transistor is high especially when we want to use 5 Volt output from 11.33 volt from the unregulated DC source or drain lot of current from it. The second one is the most efficient voltage regulator as this type of voltage regulator operates the transistor in its saturate region or known as a switching voltage regulator. The working principal is the same as the analog one, but instead of using the constant current to the transistor base lead; this voltage regulator type use pulse current or known as PWM (Pulse Width Modulation) to the transistor base lead and this make the transistor to turn on and off according to the PWM duty cycle supplied by the error amplifier. Therefore by changing the PWM duty cycle we could change the average voltage drop across the collector and emitter (Vce). The inductor (L) is used to release its energy to the load through the diode (D) when the transistor is turn off; and when the transistor is turn on then the transistor will supply the current to the load and the inductor will store the energy in the electromagnetic form; in other word the inductor and diode will ensure that the load will always get a constant current when the transistor is turn off. Now as we understand the basic of how this voltage regulator work, its time to make our own voltage regulator. Today there are plenty choices of the voltage regulator IC on the market and we will just explore some of them. The classic, widely available and the most popular one is the LM7805 or 7805 IC series, almost every microcontroller’s base project schematic use this IC, although it’s not very efficient in term of power dissipation but its cheap and widely available than we still consider it as our choice; but if you have more budget you could consider to replace it with the low dropout 5 volt regulator IC such as LM 2940, below is the LM 7805 and LM 2940 schematic. 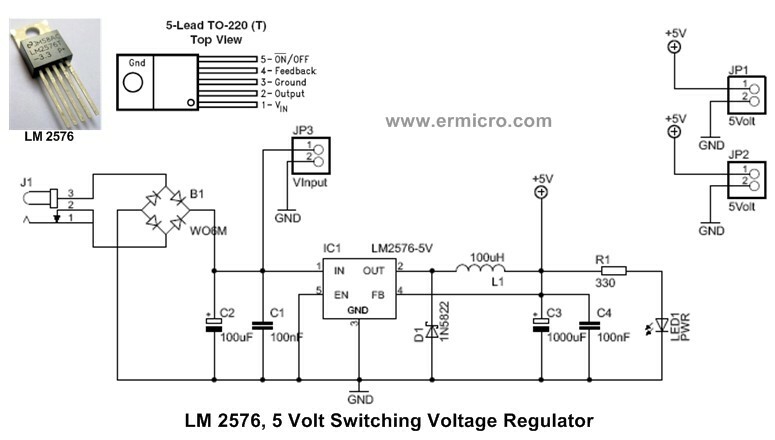 Below is the picture showing the LM 2940 IC circuit is use to power to the microcontroller’s board. The bridge is use to ensure the correct polarity supplied to the LM 2576 IC, below is the JazzMate 2576-5V board from the ermicro powering the microcontroller board. The other advantage of using the switching voltage regulator, that it’s more immune to the noise compare to the analog one especially when you control the device that generate noise such as DC motor with the microcontroller. The LM317 is the classic and widely available adjustable voltage regulator which is suitable especially for the experimenter where we need to change the voltage output regularly for example to test the brown out voltage level of the microcontroller. The basic schematic of this regulator is shown on this following picture. 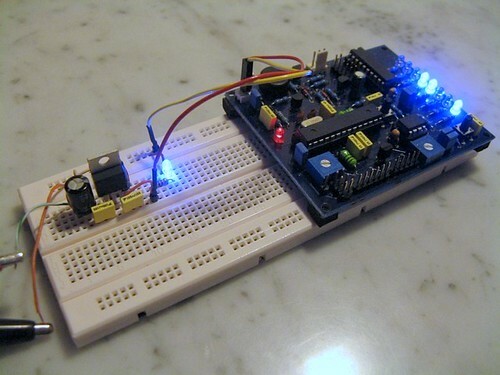 The following picture shows the LM 317 IC circuit powering the microcontroller’s board. The output voltage of Maxim MAX756 could be selected from 5 volt or 3.3 volt by putting logical low or high on pin 2 (3/5), it also supply the low output indicator detector to the circuit if needed through the pin 4 (LBO). The following picture shows the Maxim MAX756 IC circuit powering the microcontroller’s board using just 1 AA alkaline battery (1.5 Volt). You should always be aware of the power dissipation (power lost as heat) when you are working with the analog voltage regulator; therefore it would be wise to put the heat sink to the IC especially when you drain lot of current from it. Also another consideration; it would be better to separate the power circuit (voltage regulator) from your microcontroller board as it will be more flexible for you to use many type of the power source. Congratulations on your very informative article! Do you think it is possible to get a symmetrical +-5V supply from 2 AA batteries and a couple of MAX756 ? If not, what would you recommend ? Thank you. You could get more information about how to make the symmetrical step-up DC to DC converter on Maxim Application Notes AN1213 (used MAX5026) and the Linear Technology LT1615 DC/DC Converter datasheet. I want to ask you if I use this source using MAX756 for Mini Line Follower Robot and driving a motor?May we use heatsink for remove heat dissipation? Or you’re not recommend it(use Max756)?thanks a lot. Remember the MAX756 maximum current on 5 volt is less than 200mA and on 3 volt is less than 300mA. Yes you could always use heat-sink to reduce the heat.